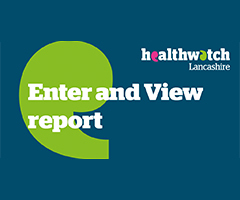 ‘Enter and View’ is the opportunity for our authorised Healthwatch Lancashire representatives to go into health and social care premises to collect the views of residents, relatives and staff at the point of service delivery and observe the nature and quality of services. Legislation allows local Healthwatch organisations to undertake ‘Enter and View’ visits in NHS organisations, GPs, dentists, opticians and community pharmacists. They are also permitted to conduct the visits with bodies or institutions which are contracted by local authorities or the NHS to provide health or care services such as adult social care homes or day-care centres.